One of the most significant rally cars of all time made its introduction to the world in 1980, with the unveiling of Audi’s rally contender, the Quattro. The Quattro was the first rally car to take advantage of the new rules permitting four-wheel-drive for rally competition, but there were some initial doubts about four-wheel-drive’s suitability to rallying. Some thought it would be too complex and heavy to be competitive. The critics were quickly proven wrong. The Quattro won its first rally on its first outing, the Austrian round of the European championship in 1981: the four-wheel-drive experiment was an instant success. The Quattro went on to win a couple rounds of the world rally championship, and Audi gained additional exposure when Michèle Mouton won the 1981 San Remo rally, the first woman to win at the international level. The 1982 season looked set to be an Audi tour de force. While the Audi was clearly the fastest and one of the most revolutionary rally cars in some time, it did have a number of shortcomings. The Quattro was rather heavy, its front-engine, monocoque chassis gave the car clumsy and unwieldy handling characteristics, and the car had problems with mechanical reliability. The car did win the 1982 championship for constructors, but Walter Röhrl took his first win of the year and the championship on the final event, the Ivory Coast rally, after Michèle Mouton’s Quattro suffered a broken transmission. The 1983 season was another bittersweet season for Audi; the introduction of the Lancia 037 promised fiercer competition (despite the 037 still being rear-wheel-drive), and the 037 delivered. Audi’s #1 driver, Hannu Mikkola, won the 1983 driver’s championship, but Lancia pilots Markku Alen and Walter Röhrl finished in the points frequently enough to give Lancia the constructor’s title. 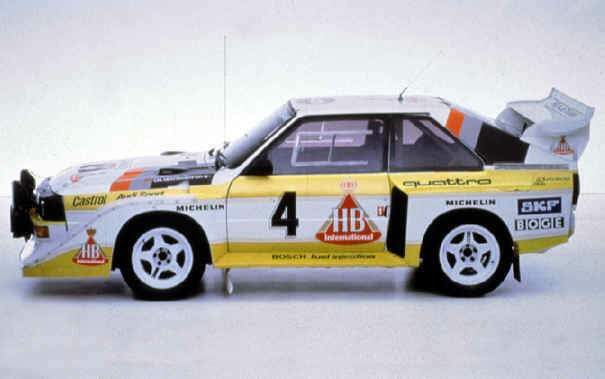 The Sport Quattro was Audi’s first real Group B car. The chassis was much different as compared to the original. Note that 320mm has been chopped out of the car between the door and rear wheel. Audi also wanted to improve weight balance by moving the batteries, oil coolers and radiators into the rear of the car. The end result was a 52% front/48% rear weight balance, but still with a high polar moment (weight far from the center of gravity). 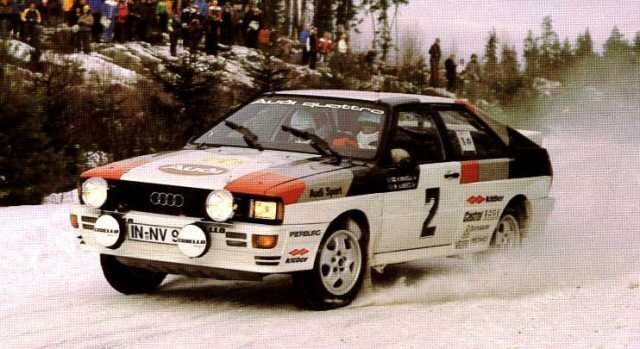 The 1984 season was Audi’s most successful year in rallying. Stig Blomqvist’s sideways driving style plus the introduction of the short-wheelbase, more powerful (450+ hp) and more advanced (six-speed transmission, kevlar bodiwork) Sport Quattro combined to take both titles for the 1984 season. However, the 1984 season saw a new challenger to Audi’s crown: Peugeot launched their brand new 205 T16 in Corsica for the 1984 Tour de Corse rally. The new 205 differed from the Quattro in several key respects: it was rear-engined, it had a space frame, and it was a generally smaller car with less weight. Peugeot driver Ari Vatanen nearly won the 205’s first rally, except a crash prematurely ended his rally. The Peugeot caused enough concern that the Audi team managers sent messages back to the engineers in Ingolstadt, reminding the engineers to keep up development, and not to be complacent with the current success. The radical Sport Quattro S1E2, introduced at the 1000 Lakes rally in 1985, proved to the rally community that Audi was very serious in its attempt to regain its previous form. 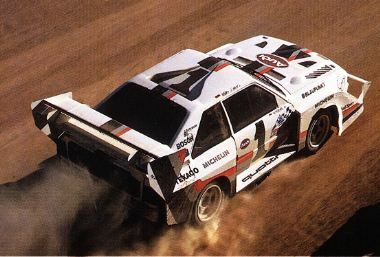 The S1E2 had more power than any other rally car in history, reaching over 550 horsepower in 1986, and it had huge wings to aid with traction on faster stages. Faced with ever-increasing competition, the S1E2 only managed a single victory, on the San Remo rally in 1985. The Quattro in its various iterations competed for four and a half years, winning four championships, and changing the face of rallying forever. Pikes Peak in Colorado is 4,301 metres high. American racing drivers had been tearing up the 20-kilometre gravel track from down in the valley until just below the peak ever since 1916. And nobody had ever been faster than 11 minutes. Audi decided that it needed to increase exposure in America. Audi decided to send its American works driver John Buffum to Pikes Peak, to compete in the annual hillclimb. The Quattro’s first attempt was impressive: Buffum set a time which was only beaten by eight purpose-built hillclimb racers. The 1983 event was similar to 1982, with Buffum finishing sixth overall. In 1984 and 1985, Audi sent Michèle Mouton to America, and in 1985 she set the fastest time ever recorded on the mountain. 1986 came, and Audi hired American racing driver Bobby Unser to drive. He won. The elusive 11 minute barrier was broken in 1987 by Walter Röhrl setting a new benchmark in 10:47.85 minutes in the 590-bhp quattro S1 prepared especially for this mountain race. Perhaps the most incredible feat Audi ever achieved in rallying never made it to rally competition. After the cancellation of Group B in 1986, Audi announced they had built an engine for rallying with more than 1000 horsepower! The engine was tested in several hillclimbs, but the drivers reported that the car was completely undrivable, with an unsettling tendency to simply go straight in the corners. The Audi engineers never ceased to amaze rally observers during the Group B days, and even today, rally fans remember the Quattro with a mixture of awe and respect. Audi had seen the success of the mid engine group B cars and knew the limits of the Front engine layout they had been using since the early 80s. Audi planned to create a mid engined Quattro to replace the wild S1. Walter Rohrl had tested a mid-engined version of the short wheelbase Sport Quattro at Audi’s test facility in Desna, Czechoslovakia. That project as well as the 002 were official Audi Sport projects – although in the case of the ‘Group S prototype’ it was conducted in so much secrecy that not even Ferdinand Piech knew much about it! Both cars, incidentally, were fitted with the regular Sport Quattro engine, so they’re not strictly Group S. The car would have made around 300hp if it was intended for Group S. Not sure why they would need a 6 cylinder engine to make this power, but they probably had a good reason. This car is currently on display in the Audi Museum in Ingolstadt, Germany. According to writer John McIlroy it only has 12 km on the clock and was likely never even tested.